The home office is a place of convenience, where so much important stuff often goes one, but it also can become a place of chaos fairly quickly. This month’s Simplify My Life task is the home office declutter. If you do not have a home office, you can instead tackle your computer desk or any other space in your home that may relate to where you do your important stuff like budgeting, mail sorting and all that fun stuff. My home office is somewhat horrendous. It is also a craft room so the dual purpose has it looking like a bomb site pretty much all the time. Back in my days of scrapbooking often, I was a bit of a supplies hoarder so now that I do more digital scrapbooking than anything else, it’s time to downsize big time. But my other office supplies need some major overhauling as well. For many of us, paperwork tends to be one of the worst parts of the home office. For that very reason, there is no need to tackle that part of your home office declutter just yet. Put any loose paperwork aside because next Tuesday we will sort through the paper mess as part of our next Organise task. Now think about it… the home office is a place to be productive so if yours is a mess, you are probably no where near as productive as you want to be. That’s what makes this space such an important one to have clear and functional! Make sure you have a place for everything and put everything in its place. Set up hanging files or in trays to control paper clutter. Minimise the amount of decorative and unnecessary items in your home office. Keep your cords organised and untangled & keep cables in a certain place so you don’t end up with random spares and no idea what they do down the track. Don’t hoard excess electronics that either don’t work or aren’t needed. 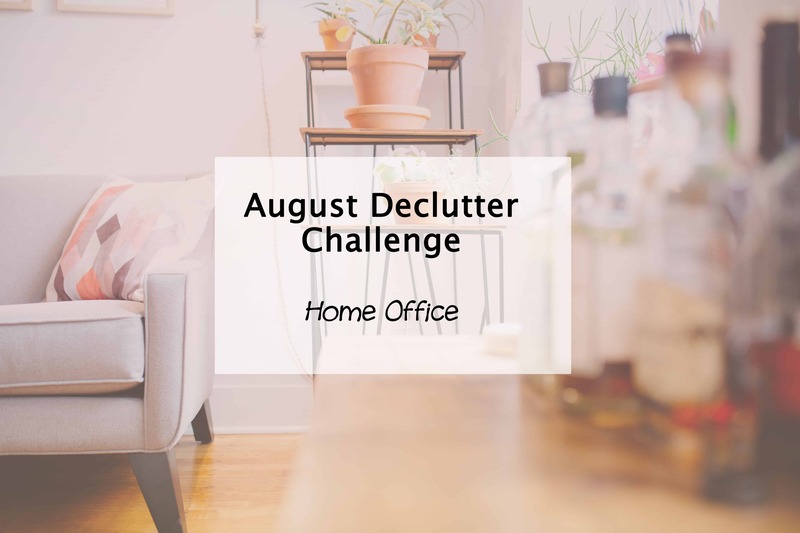 Pop over to the challenge page for links to other declutter, organise and simplify tasks as part of the Simplify My Life Challenge. It’s not too late to join in. We’ll be going all year long! Do you use your home office for more than one purpose? Craft room, kids homework, spare room? My home office is also the kitchen bench, toy storage area and general junk resting place! I’ve actually got a designated office space in another corner of the house but it rarely gets used as I can’t see the kids from there. I love your decluttering advice – can you come over to my house please??? My office is the one room in my house that I’m not proud of lol since Turing the spare room into a kids room, my office is now also a musical instrument storage room. Big job ahead and one I’ve put off. I’m normally ahead on the tasks ☺️ but I’m a bit the same with not being able to see the kids from there. Never a good option! Eeek… Thanks for letting me know. Must have attached the wrong file. I will fix it up right now. I know the feeling. Our extra storage space became a bedroom & suddenly the mess gets shoved elsewhere. Big part of why I created this challenge. Oh yes, great points and thanks for the reminder. I need to declutter my desk (no office) this week. I seem to do it every couple of weeks and crap just piles back on there. I probably need to think about where to house some of the things which keep returning! Good luck. Hope you manage to get it in tip top shape. It’s amazing how much can accumulate in that one room. Mines also a craft room which is probably the main problem ? We don’t have an office, but oh would I love one! I need a space to store my writing things.